Typhoid fever is an acute illness with fever associated with the Salmonella typhi bacteria. Salmonella paratyphi, a related bacterium, can also cause typhoid that usually is a less severe illness. The bacteria are deposited in water or food by a human carrier and are then spread to other people in the area. The occurrence of Typhoid fever is not that common in the UK, with an estimate of only 500 cases each year. Moreover, these cases arise when UK residents visit other countries for their travel or visiting relatives in countries like Bangladesh, India and Pakistan. This disease is prevalent in most of the parts in the world, including South Asia, Central and South America, the Middle East, and Africa. Typhoid outbreaks have prevailed over the years in countries like Kyrgyzstan, Ukraine, Tajikistan, and Russia. Symptoms include a high temperature that can reach 103-104F followed by stomach pain, headache, constipation or diarrhoea. How can typhoid be prevented? Drinking water only from a sealed/reliable source or water that has been treated using a quality filter is highly recommended. Avoid using ice from an unknown water source. Avoid consuming uncooked/ partially cooked food. Eat fruits that you can peel yourself. Ensure food is freshly cooked and consumed hot. Use of a hand sanitizer is highly recommended. 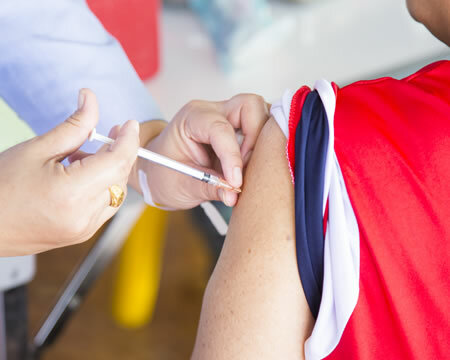 If you are planning to travel to parts of the world with high risk of typhoid fever, book an appointment with us today for a Typhoid Vaccination service. Typhoid vaccination becomes mandatory if you are living in close proximity with the local people.